This thread is used to report the latest changes to GroveStreams. The date of the post will reflect when the change occurred. 1) Changed dashboard chart widget Refresh button to query for all samples so that changes to historical samples are also displayed. 2) Fixed [Bug 0003] : New Notifications Missing. The "Show messages from" date will be automatically set to "Today" when the notifications window is opened or when the Refresh button is clicked. 4) My Default View: Added the ability for a user to mark a dashboard or map as their default view. The default view will be opened automatically when the user enters Observation Studio and the Quick Viewer will also be automatically collapsed. Right click on your dashboard or map within Content Explorer to see the "My Default View" option. 5) Added the ability to copy streams within the component and component template editors. The user has the ability to enter the number of copies they would like to make up to 100. All of a stream's attributes are copied except the name has "(copy)" appended to it and the ID attribute is cleared. 6) Added "Remember me" to the re-authentication window. Tired of being prompted for your credentials? Then click "Remember me". 7) The organization combo box at the top of the studios is now hidden if there is only one organization. 1) Enabled SMS texts to all major countries. We will be enabling almost every other country once we are confident things are working correctly. Send us your country if your texts are not working and we'll enable it sooner. * Share dashboard was broken last week. Fixed. * Component definition became corrupt if a component was saved via the advanced API and streams had the same UID. Fixed. * Component definition became corrupt if a stream was added to the component, used in a stream derivation formula, and then was deleted from the component during the same editing session. Fixed. 1) The great folks at Ninja Post have added a code button for formatting code in our posts. I haven't tried it yet, but I see it. You might have to do a hard F5 browser refresh to pick it up. 1) Fixed intermittent missing email notifications sent from events on derived streams. 2) Improved the order of Start and Stop Notification arrivals during rapid event triggers. Rapid triggers can occur when many samples for a stream are uploaded or derived within the same transaction. 3) Changed Event Delay time from inclusive to exclusive. See the modeling guide for a Delay example. 4) Added Event Dwell feature. Dwell is the amount of time that must elapse between the start of one event to allow the next event to start. This property is useful for avoiding event storms that may send many notifications in a short period of time. See the modeling guide for a Dwell example. 5) Improved SMS notification system error messages. SMS delivery error system notifications were too vague for a user to determine what was wrong prior to this fix. 6) Improved string length validation error messages. The first several hundred characters of the string are now returned to help users identify the string that is too long. 7) Allow users to set the polling interval for notifications. Notification polling transactions are included as part of the monthly billing transaction count so we now allow users to decrease the polling amount to keep their transaction counts lower. Also added the Show Notification Pop-ups switch to organization information so that the switch value is retained between sessions. 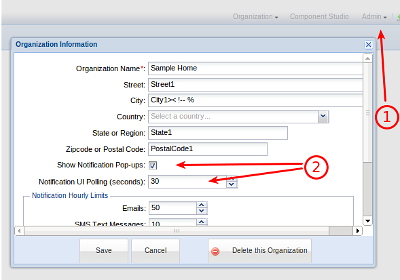 Click on Admin - Organization Information within a studio to change the polling amount or to disable notification popups. 8) Allow comments to be added to expressions. Java style comments and hashes are now supported. 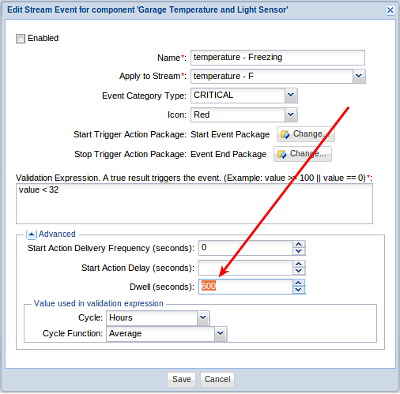 Example: If a latency of 121 seconds is set, the [comp_event.updateLatencyFormatted] value will be "2 minutes 1 second"
1) Fix for dashboard chart label formatting. Line chart tic lines could appear to be in the incorrect position. This could happen when the axes label value decimals are trimmed off during the formatting of the label. Axes tic lines will now only be drawn on whole numbers if the result of the formatting is a non-Decimal number. 2) Fix for Random Stream Viewer save. Editing some historical values within the Random Stream Viewer and clicking Save sometimes did not actually save some of the new values. 3) Fix to remove cell dirty flags within Stream Viewers after a successful save occurs. 4) Allow users to enter seconds within Stream Viewer date range navigation selectors. 5) Updated Feeder Gallery page. 6) Ninja post fixed the issue of smileys appearing within code snippets within forum posts. 2) Added the ability to create a component template based on an existing component. Right click on a component and select Create Template from Component. 3) Improved navigation performance within the Component and Template editors. 4) Fixed Time Filter bug where UTC time zone was applied within stream derivation. Thank you for the documentation of the updates. I have an application that creates updates when an event occurs, think door open or door close. So when that event occurs, I start the Ethernet connection, and update GS and shut it down. 1.A question is what in my case is the purpose of updateFrequency in the Arduino script? As long as I keep a PUT call from occurring within 10sec of each I should be fine, is what I'm thinking and I wouldn't use updateFrequency. Is updateFrequency a needed data element for GS? Does it trigger other actions. For the present I have set it quite low, knowing my events don't occur more than 20 times a day. 2. Even though the events occur ~20 times a day,I see updates to the Random (stream table) being updated every few minutes, varying. I would expect that the updates wouldn't exceed my ~20 quantity. As always, thank you for clarifying my thoughts. updateFrequency is only used by the GS Arduino sketch to test if enough time has occurred to do an update. Thank you for taking the time to display the suggested changes. I removed updateFrequency (for those who are wondering, I don't update on a fixed interval, so don't change your Arduino sketch unless required) and things work fine, as well as reducing the number of transactions required. 2) Added a Refresh button to dashboard toolbars. All widgets can now be refreshed at the same time. 3) Widgets now allow their polling values to be set to zero. Zero indicates not to do any polling. 4) Fixed time filter bug that occurred for interval streams when the time filter interval size was larger than the stream interval size. 5) Fixed Gauge graphics when the stream value was greater than the gauge configured maximum. 7) Added a default numeric format setting to new Units. 8) New organizations will now default widget polling to zero or no polling. 9) Organization constraint settings (polling limits and notification hourly limits) are now included within blueprints. 1) Added the option to graph the start date or end date of each interval stream's interval within a widget graph. The start date is the default for all new graph widgets. 2) Fixed a bug that caused events to end prematurely. This bug only existed for Interval Streams during the batch upload of many samples for a single stream with values that triggered events followed by gaps. - All Feed PUT APIs will now create generic components and random streams if the components or streams do not exist. We used to return an error if they did not exist and a component template was not included. - All Feed APIs now have the ability to dynamically create streams on-the-fly based on a component template stream. This is done by including two optional parameters on the Feed PUT URL: dsId: The ID of the stream to created the new stream from. dtId: The component template ID that dsId belongs too. More information about automatic registration can be found within the modeling guide and within each Feed PUT API resource page. 1) Added the ability to forward system notifications as emails to the owner of the organization. 2) Added Close/Open and High/Low to Boolean Unit formatting options. 1) We no longer show an error window if automatic notification polling encounters errors. 2) Added a Raspberry Pi Metrics Tutorial. This tutorial installs a Python script onto the Raspberry Pi. The Python script uploads the Raspberry Pi's system metrics (cpu, memory, disk) to GroveStreams. Take a look and send us some feedback on how we can improve the tutorial before we pass the link around. Thanks! Corrected the above link. A more simple GS experience is in the pipeline. Thanks steve. 2) Changed "?&" to "?" for many of our URLs including calls made from our website and RSS calls. ?& wasn't causing any problems, but it's not the proper way to include the first URL parameter. 1) Fixed line/bar chart widget axes min/max bug. Min/Max had stopped working for a while. 1) Fixed a derivation bug that prevented a component with a derived stream with a variable argument function (round, min, max, ect.) from being saved. This bug was introduced last weekend. 2) Added Tick Interval axes setting to line/bar graph widgets. It allows for the setting of the frequency of tic lines and solves some axes min/max issues with non decimal formatted axis. 3) Added the organization name to the subject line for system notification emails. 3) Fixed pipe, |, delimiter bug for JSONless feed PUT URL. 4) Fixed feed unit formatting bug. A format of 0,000 would still leave a decimal on a number after formatting. This only occurred when formatting occurred on a GS server and not in java script within a browser - which is rare. [stream.latestValue] - The latest value of the stream. [stream.latestValueWithUnit] - The latest value of the stream with the unit. These new variables are useful for when a Delivery Frequency is being leveraged. Messages can now contain the initial trigger value and the latest stream value. 3) Fixed a bug that set a user's timezone to UTC when they edited their profile from the mobile site. 4) Fixed a bug that prevented the component tracking widget from showing components when it first appeared. 1) Added an Energy Cost Tutorial. 1) GS now sends a System Notification when new streams are created dynamically during a feed PUT. 2) Added the capability to copy an Action Package within the same organization. 3) Fixed graph tick interval setting not saving bug. 2) Fixed a bug within widget charts that caused lines to not appear if one of the streams had not uploaded data within the time span being viewed when X number of Cycles were chosen. 4) SMS support for Mexico.